The Montana DOT – TAMP is available here. 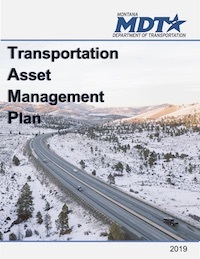 This Transportation Asset Management Plan (TAMP) is Montana Department of Transportation’s (MDT) first formal plan that builds from the foundation established by P3 and describes how MDT manages pavements and bridges to fulfill the requirements of MAP-21. A previous draft is available at: http://www.tamptemplate.org/wp-content/uploads/tamps/030_montanadt2016.pdf. This document includes the following sections: Asset Valuation, Financial Plan, Introduction, Inventory and Condition, Investment Strategies, Lifecycle Management, Objectives and Measures, Performance Assessment, Process Improvements, Risk Management.